Profounda, Inc. announced Friday that it has received, the US Food and Drug Administration’s (FDA) Orphan Drug Designation for the treatment of Primary Amebic Meningoencephalitis (PAM) with miltefosine. 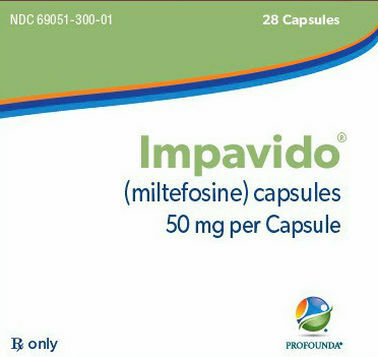 Profounda licensed miltefosine (Impavido) from Knight Therapeutics (USA) Inc. in September 2015. Impavido® (miltefosine) was used to successfully treat a patient in the Orlando area in 2016 with a Naegleria fowleri infection. Impavido is the first and only oral treatment for visceral, mucosal and cutaneous leishmaniasis approved by the U.S. Food and Drug Administration (“FDA”) and the first Rx product launched in the U.S. by Profounda. Miltefosine has been recommended by the CDC for treating Primary Amebic Meningoencephalitis (PAM). Miltefosine achieves a high concentration of the active drug in the brain tissue as a result of excellent passage through the brain-blood barrier. Miltefosine is an alkylphosphocholine compound originally developed as an anticancer drug, which is now established as an effective anti-leishmanial therapy. It acts on key enzymes involved in phospholipid and sterol biosynthesis, suggesting that the cell membrane is its main target.